PuzzleMad: I got lost in the catacombs as well as the KCube! After last week's mammoth post (which did not seem to be particularly avidly received - do you all really dislike twisties so much?) which must have taken me a total of 8 hours to photograph and write, I am back to a much shorter one on a puzzle you will all appreciate. The Chinese rings puzzle is a classic - it is one of the "must have" puzzles that all puzzlers should own - partly because it has been around for so more than 2000 years and also because it is such a nice fun one to solve! 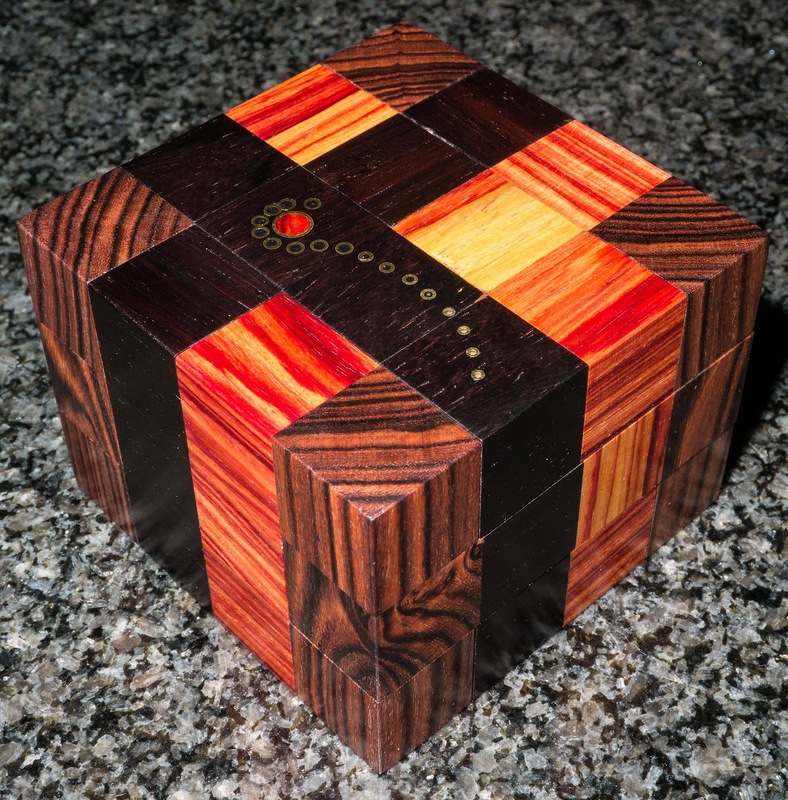 I have already written about the one I got from Livewire puzzles some time ago and thoroughly enjoyed it. But it only had 6 rings on it and really didn't take very long - let's say it was a beginner version. I also have a lovely heavy metal version which was sent to me by a very kind friend from the US. 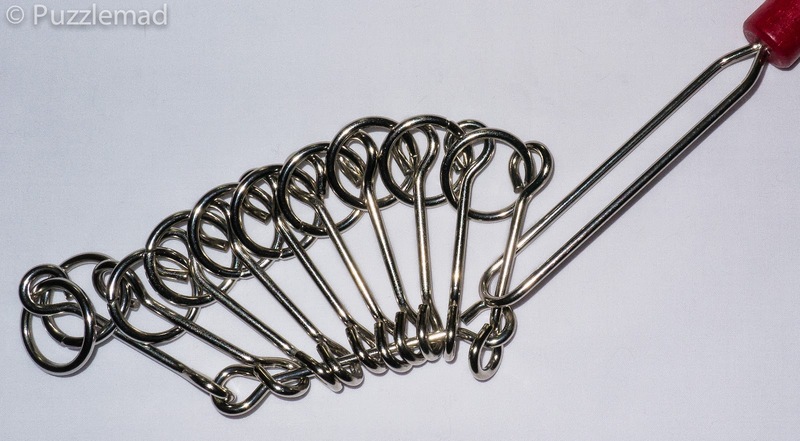 This version is made of steel by Tucker Jones and is called the Patience puzzle - it is absolutely stunning but not high enough level. I had seen on YouTube and also on Goetz' wonderfully informative site that there were variants that had more rings and hence, many more moves to solve. 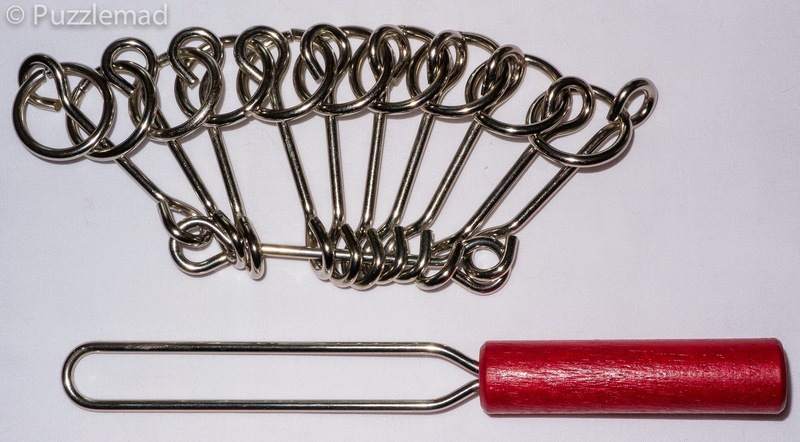 I regularly browse through the Puzzle Master wire puzzle section to see if they have anything new for me and realised they had a Chinese ring puzzle so I ordered the Puzzle Master own brand version in my last order so that I could have a "grown up" version to try! The Catacombs plus is a beautifully made version with not just 1 or 2 extra rings - it has 10! For this reason it has been rated as a level 10 (Mind Boggling) on their difficulty scale and despite the fact that it is just based on a binary version of Gray code, it is a real challenge and certainly not something to do when you might be interrupted and sent off to do other chores. It arrived in Puzzle Master's standard clamshell packaging (albeit a much longer one than usual) and the only instructions are to remove the handle. 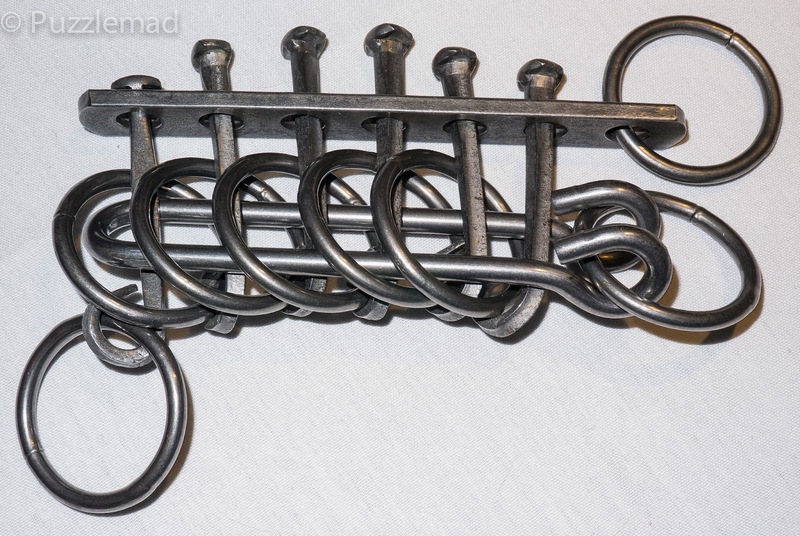 It is beautifully made with really nice thick anodised wire, a good quality handle which makes holding it for prolonged periods much easier than the ones with wires only and, as you can see, has 10 rings on it! Dimensions are 3 x 20.5 cm. No solution is given and hopefully you won't need one but if required the solution method for an easy version can be downloaded from here. This is obviously rather less than claimed by Puzzle Master BUT when I did it, I certainly took way way more than 1000 moves!!! Rule number one - You need to pay attention to where you are in the solve! There will be no multi-tasking whilst you do this - as a bloke I rarely multi-task anyway but initially I was chatting to the present Mrs S and on at least 3 attempts I miraculously found myself at the beginning again. Luckily, I had not been trying too hard. Rule number two - DON'T stop half way through and do something else! I was rather forcefully told that I had chores to do and so roughly half way through I put it down and off I went to be a good husband and try to decrease the pressure she had put on my forehead thumbprint. Later on I returned to it and quickly resumed and again miraculously found myself back at the beginning again! I reckon that I must have been approaching 1000 moves by now! I found myself with the handle unlinked from the ring but caught on the rod beneath it - I continued the sequence and very oddly (almost miraculously) I found myself back at the beginning again! Help me!!! Starting again I again found myself back at the point above. This time I must have spent 10 minutes desperately trying to work out how to progress from this point and no matter what I did, I just couldn't do it. In the end I had to "continue the sequence" and, you guessed it, miraculously ended up at the beginning again! I am sure that at this point you are all wondering how I actually manage to keep myself alive, fed and dressed (as am I) because I really don't appear to be very bright. Let me assure you that I have several degrees and am generally thought of as mildly intelligent - my patients really are safe in my hands, I promise! Solved - I need to lie down now! At the moment, it is sitting next to me unrestored - I can't actually face putting it back together again just in case I end up going round and round in circles again. Overall, this is one fantastic puzzle and I really learned a lot from solving it - if you do want a slightly (sic!) tougher version of the Chinese rings then the version from Puzzle Master is definitely a great one to buy - at $18 it's a bargain - I had several hours of "fun" with it. I think it might be time for me to lie down! 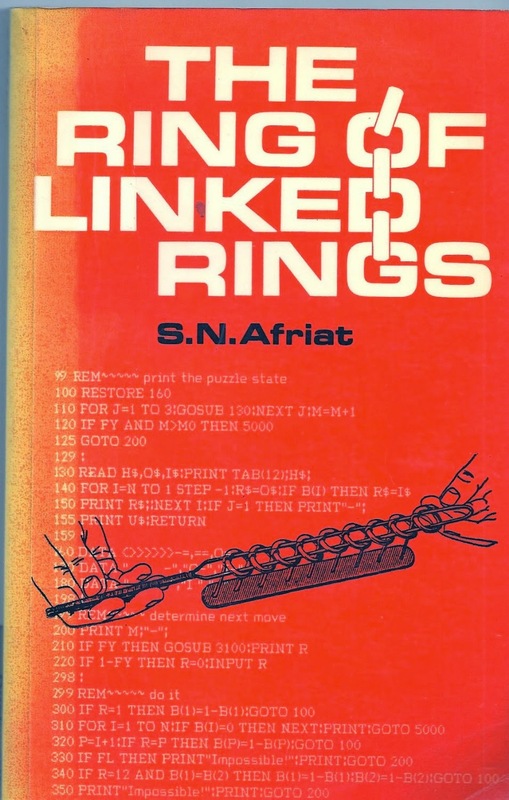 If you are not satisfied with the great exposition on Goetz' site then I suggest you track down a copy of "The Ring of Linked Rings" by Sydney Afriat - it is a wonderful book published in 1982 (ISBN-0715616862) about all these sorts of puzzle and has lots and lots of programs in BASIC for you to type in and explore these puzzles. Now, I need to find a BASIC interpreter for my Mac! Oh that brings back memories of spending day after happy day of typing code from magazines into the Tandy TRS 80 or later, the Dragon 32, only to hit Run and have it all crash on me (usually a syntax error!) or to lose it when the tape deck munged my tape! Rule number two is particularly important - I have a beautiful copy of Kim Klobucher's MMMDXLVI cube (an N-ary puzzle and NOT a box because I don't collect boxes) which requires 3546 moves to solve. Allard's recent review of his copy as well as this blog post reminded me of how many times I ended up at the beginning again with my version. I kept being side-tracked into doing something else and promptly forgot which way I was going and ended up with one of those annoying little miracles so many times that I despaired! These are very hard to get hold of and rather expensive (if stunningly beautiful) and are well worth buying but if you cannot get hold of one then try the Chinese rings instead! That's great Jez, thanks a lot. I'll also lookout for an installable interpreter too! At least I won't need to worry about cassette tapes!!! I found out about the book from your site (thank you!) I can't wait to get around to the programs. A 25 ring puzzle? It would take me the whole of my life! That is 22,369,621 moves! - OUCH! I was just looking at your K Cube. Beautiful. Are the metal rings on top for deco or they serve a purpose. It is a lovely thing! The metal on top is purely decorative - it's a brass inlay and filled with Tulip wood.